Via this menu item the current Mz3 project can be saved under a different, new Mz3 project name. A 100% copy of the current Mz3 project will be created. Test settings without jeopardizing the actual Mz3 project. At the end of the tests, i. if you find out which settings are correct and after they have been included in the actual Mz3 project, you can delete the copy again (Delete Project). Create a new version / edition of a magazine (for example, the next month’s edition) with the settings of the most recent edition. Since all the settings such as page thickness, hardcover, drag rank, page size, … are taken over by the copy, this ensures that the new magazine behaves and looks exactly like the previous one. After deleting all contents (Modify Elements On Pages or Delete Or Insert Pages) the pages can be filled with new content. 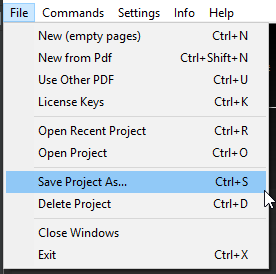 To do this, give the copy that was created with@Save Project As@the desired, new name and then delete the original program with the unwanted name. The window displays the known Mz3 projects. 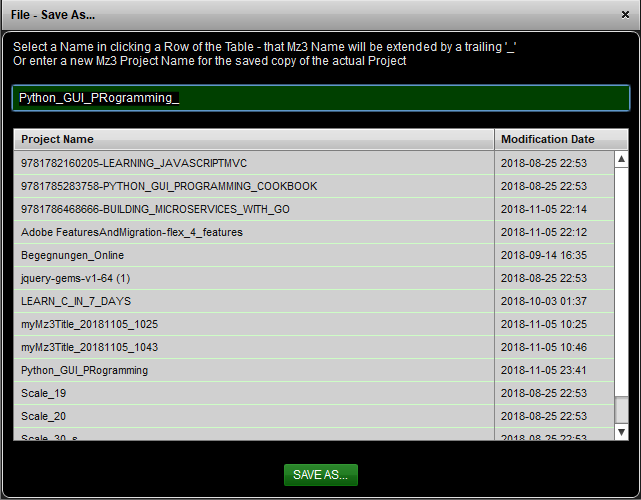 Clicking on a line will inherit the corresponding Mz3 project name. The Mz3 name is completed by an underscore “_” at the end to create a new, unused name. !Mz3 project names must be unique! Alternatively, you can also enter any name with at least 4 characters. The length is checked. It is also checked if the name is allowed or already taken. In the event of an error, this is indicated in the status line at the top of the “Save As” window (as a yellow status text). If the name meets the requirements (from mz3Tool and your own ;-), the copy can be started by clicking on@Save As ..:@. Upon completion of the copy, the copied Mz3 project will be opened immediately.